When Italian photographer Massimo Sestini captured an image during the Mare Nostrum rescue operation in 2014, he didn't know it would go viral. After realizing the impact the photo had on viewers, Sestini began the "Where Are You?" project to raise awareness and find out what became of the hopeful faces captured in the image. InterAction: You've spoken about how you wanted to capture a 'very specific moment' for refugees seeking safety. What about this moment spoke so strongly to you? Sestini: I had been planning and—literally—dreaming of taking that specific photograph since 2013. I didn't want simply take a picture of a boat full of migrants from above in a zenithal perspective. I wanted to capture the moment of relief and hope. On June 7, 2014, after many stormy days on board of the Bergamini Frigate, we could spot an extremely crowded boat and flew over it with a helicopter. All the people on the boat looked up at the helicopter as they immediately understood that they were safe, at last. That was the moment and the photograph I meant to capture (it is actually the very first shot I took during that light). InterAction: What inspired you to follow up with the individuals in this image? Why do you feel it is important to tell their stories? 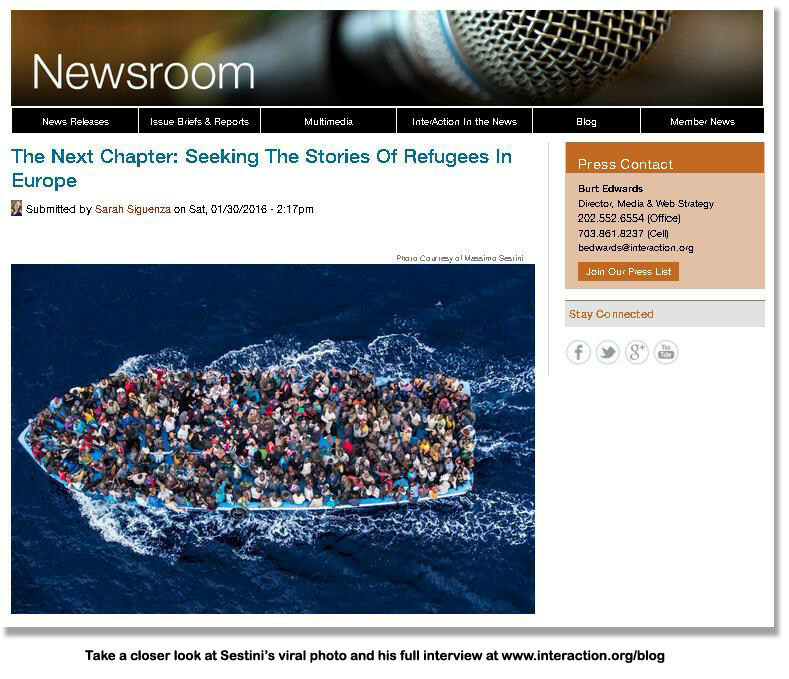 Sestini: I wondered many times what happened to all those people, how their lives changed in Europe. Many others, after seeing my photograph exhibited in museums and other venues, asked the same question. After a person from Switzerland informed us he recognized a relative of his in that photograph, we decided to start working on the project. Knowing that at least one out of the 500 migrants rescued from that tiny boat in 2014 had started a new life in Europe was truly inspiring news and gave me the idea of creating a photographic project: "Where Are You?" With this project I'd like to finally give a face to what nowadays is often perceived as an undifferentiated herd. We would like to get to know the faces of this large group of people, to tell their individual stories, and describe and show each one of them. That's the job of a photographer in these particular situations, because the macro-story—the news he or she captures—is the sum of hundreds of micro-stories. InterAction: Approximately how many individuals have you been able to locate so far? What stories stand out? Sestini: My team and I were contacted by a group of people living in Italy, and so far we've found 25 people. During our time with them, we asked a few questions about their past, the journey, and their future. When we asked "What do you fear the most?" one man said "Ebola." When we asked another the reason why he left his country, he replied with another question: "How would you feel if you were born in a place where you are not welcome anymore? I had to leave people I've known my entire life. I had to leave my family behind. What we have in our country is not war, it is injustice." Read the full interview with Sestini at www.interaction.org/blog. InterAction is the largest alliance of international NGOs and partners in the U.S. Our 190+ members work in every country, partnering to eliminate extreme poverty and vulnerability, strengthen human rights and citizen participation, safeguard a sustainable planet, promote peace, and ensure dignity for all people. For more info, visit:www.interaction.org.